Full use of the whole house including the two kitchens (one indoor fully equipped, one outdoor with dishwasher, sink and refrigerator) and exclusive use of the heated salt water swimming pool and sauna. Cathy and Babeth who lived close by will take care of the cleaning of the Mas as well as anything that will require immediate attention. They speak only very limited English, so prepare to practice your French! Balazuc – Beautiful, and great place to swim. Much less crowded than Vallon Pont D’Arc. Other water sport favorites are the streams that descend from the Massif Central – towards Antregues, and Le Puy. Pont de Diable is great – go early to beat the crowds. Ardeche is the world chestnut capital. The beams of the house are chestnut, many of the trees outside are chestnut. Visit the 'Museum de Chataignes' in Joyeuse. Enjoy 'marron glaces' (candied chestnuts), or simply a salad l'Ardechoise (with chestnuts & goat's cheese!). Bourganel – Ardeche’s local beer – you can tour the brewery in Vals-les-Bains. They make lager (blonde), and then several local varieties; chestnut, blueberry, miele de chataigne, verveine. Closed on Mondays. Vineyards - There are many local vineyards, and local 'caves', (collectives) in the villages. Southern Ardeche is home to the Cote du Rhone appellation, the oldest wine growing district in France...try the Grand Ardeche from Louis Latour. You can visit Latour’s chardonnay caves in Alba-la-Romaine. Caves - There are huge caves and spectacular grottos, majestic valleys, canoeing and white water rafting, spelunking, mountain climbing, gliding and parasailing, and on the many quieter streams, fly fishing. Nearby is 'la Grotte Chauvet', evidence of one of the earliest European settlements. We live in Kamplala, Uganda. Brett runs the UN World Food Programme's Global Centre for Post Harvest Loss Eradication, helping farmers across Africa to handle and store crops effectively. Rosa is a recovered banker who is now a fitness professional with a focus on kite surfing, yoga and pole dancing. We fell in love with Ardeche. After many years of living in dense urban environments in Asia, St Laurent sous Coiron was the perfect remedy. Fresh, open, peaceful, slow-paced. When we bought the property it was with the intent to start using it immediately, but with some part of the house we could renovate, and put our own 'stamp', or personality into the house. The renovations of the barn took over two years...but it is worth it. There is really no way to put 'the view' into a photos. From the 5 bedrooms facing the pool deck, and of course, from the pool itself, you have an ... enormous sky - a 180 degree panorama overlooking the Ardeche valley, and to the south, over 100km away, you can see the mountain ranges that are just off the Mediterranean coast. We had no desire to be closer to the crowds, the noise, and the traffic of the cote d'azur. At night, there is so little light pollution that you can see the satellites passing overhead...even more fun when you have just come out of the sauna, and are lying face-up in the pool. All new - 2012 renovations: New 200cm x 170cm Scandinavian sauna, twin sauna showers + WC. Interior connection to the main salon and it's new open hearth fireplace. Sauna accessible from the outside. New upstairs bathroom with two sinks and long 180cm bathtub/shower combo. Good for tall people. New upstairs shower room with two sinks - two shower heads in same, large stall. WC's intentionally located near, but separate from the shower / bath facilities throughout the house. Downstairs bedroom has ensuite shower/bath combo. Outdoor jacuzzi and pool heating added spring 2015. The new sauna is accessible from both inside and outside, near the pool. Meter-thick walls keep the mas cool during the summer, and warm during winter. As the mas is at 550m elevation, it is high enough in the summer to beat the severe heat of the valley, but hot enough to enjoy a dip in the pool. Have a sweater onhand for pleasantly cool evenings. The downstairs bedroom is ideal for anyone with access challenges - there are wide double doors, no stairs. A second stay off season in this beautiful mas. Despite the unstable weather, we were able to enjoy the new jacuzzi on the terrace sipping lovely cocktail after a relaxing sauna. A perfect home for a holiday with friends and family. Many thanks for the kind words. It is really nice to hear that even during the off-season, you were able to enjoy the house and its surroundings. This is the reason we added the jacuzzi as well as the swimming pool heater so that our renters could more fully enjoy the place throughout the year. Beautiful and charming property. The view and sunsets are breathtaking. 100km+ of unobstructed nature view. A unique place. The property is very well maintained and has a homey personal touch, it shows that Brett and Rosa really care for and love this place. the kitchen and equipment is top notch and well maintained. The region is wonderful. In the summer peak as beautiful and charming as provence without the crowds. So many activities (go karting, acrobranche, river rafting, hiking) and lots of charming villages with great food in the area. We had a really nice stay in this place! The house is awesome, everything was clean and pleasant. Brett & Rita are very kind and always available to answer your questions. The view is worth it! It's quite easy to make yourself at home in such a place! All of us were very happy of our holidays there. Don't hesitate! An ideal location for a family holiday. Great facilities - rural luxury in an amazing setting of some of France's most beautiful scenery. Although isolated it is still close enough to get the breakfast croissants from the local village. The house has every facility and amenity you can think of and more. Your own private pool offers an additional luxury to your holiday (but cold in September). Try the Beatrix Restaurant in Vals des Bains for authentic French cuisine on your travels around the Ardeche - rivers, gorges, mountains, forests, walks, water sports, villages, grottos .........One essential visit is l'Aven d'Orgnac limestone caves - one of nature's wonders with dramatic caverns and superb guides. 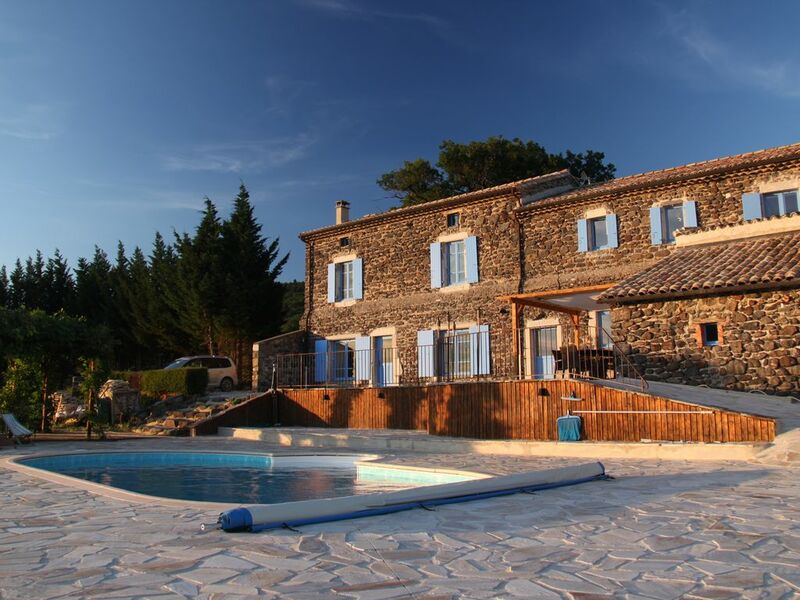 You will not be disappointed with this farmhouse in St Laurent sous Courin or the profusion of activities and opportunities available in the Ardeche. Heater for the pool being seriously considered...we agree! So pleased you enjoyed! We enjoyed an amazing long weekend in the house in St Laurent sous Coiron and have no hesitation in recommending it to anyone who is looking for a true French countryside experience. The area has all the makings for a perfect holiday: serene environment, a wide range of activities for all ages and great climate. Foodies like us, particularly enjoyed the abundant farmer's markets where tapenade, cheeses and salami of all varieties (blueberry salami anyone?) could be picked up and aspiring photographers could practice capturing the perfect shot of bundles of asparagus and garlic strands. There are plenty of good restaurants in the surrounding quaint little towns or why not go straight to the source; tastings at the local vineyards was easily booked. If you have a sweet tooth, you are really in heaven; glace aux marrons, tarte aux pommes, and crème caramel, not to mention the proximity of the Valhrona Chocolate factory can offer you all the indulgence you are seeking. The house (use a GPS to find it) offers as much charm as comfort. The size and layout allowed for privacy even when occupied by several families. We particularly enjoyed the location and stunning views, ideal for sun-downers and stargazing, the refreshing pool and having the choice of both outdoor and indoor kitchens for culinary adventures. The rooms are spacious and beautifully decorated. For those of us who are not fully able to shut down from the modern world (or risk missing the Olympics), international channels and Internet connectivity was a blessing. While we were there in the summer, I would love to come back during the colder months to find comfort in the fireplace and sauna after a long day of hiking and antique browsing. Before leaving, don't forget to pick up some local goat cheese and honey, a couple of bottles of Chardonnay, lavender and Savon de Marseilles - the smells are sure to make you want to return to Saint Laurent cous Coiron soon again. Traumhaftes Haus mit viel Platz und liebevollen Einrichtungsdetails! Eine Küche zum Zaubern frz. Köstlichkeiten. Ob Sauna, am Ofen oder am Pool - all diese Dinge kann man bei jedem Wetter genießen. Tolle Ausblicke, kilomerterweit, dazu ein Rotwein - traumhaft ! Zum Einkaufen oder für Aktivitäten, wie Rafting, Canjoing, Go-Kart sind es nur 20 min. mit dem Auto. Brötchen und Kleinigkeiten für den Tag gibt es im 10 min. entfernten Dorf ! Wir haben den Aufenthalt mit unseren beiden Jungs und der Freundin sehr genossen ! Thomas, Claudia; Dan, Bjarne, Marlene. Ardeche is home to one of the world's most celebrated ancient caves, the Grotte Chauvet. In April 2015, a €55 million replica of the cave opened in Vallon-Pont d'Arc, 45 minutes south of our home in St Laurent sous Coiron. It is amazing. This is a highly accurate reproduction of the closely guarded Grotte Chauvet, which was granted World Heritage status last year and which has never been open to the public. Ardeche is among the most tranquil areas in France (the only department in France with no rail or Autoroute), yet it is still easy to access by either air, TGV, or by road. The Valence TGV station is only two hours from Paris or CDG Airport, and the car rental agencies (Avis, Hertz, Eurocar, National, Alamo) are conveniently located next to the station. The mas is a beautiful 60 minute drive from the TGV station. Coming from the north, you'd take Exit 16, Loriol, on the A7 Autoroute de soleil, and then the D104 up to the Plateau de Coiron. From the south, via Montelimar, you'd take the Route de Teil and the N102 direction Aubenas. We will give you detailed driving instructions. Try Google Earth (maps.google.com). Look for the pool. If you search for “Dazy, Saint-Laurent-sous-Coiron, France”, you will land just north of the house.